The human rights alliance Karapatan strongly condemns the killing of Bayan Muna-Aklan provincial chairperson Fernando Baldomero who was shot this morning while on his way to bring his child to school. Baldomero, who is also a municipal councilor of Lezo, Aklan and at the same time provincial coordinator of the Makabayan Coalition, is the first victim of extrajudicial killing since President Noynoy Aquino was sworn into office. An attempt was made on Baldomero’s life early this year when his house in Bgy. Sta. Cruz Bigaa, Lezo, Aklan was lobbed with a grenade by two men riding in a motorcycle. According to initial reports, Baldomero was in front of his house, while trying to start his motorcycle to bring his child to school he was shot by two unidentified men. The attackers were armed with a 9mm pistol and long fire-arms. Karapatan chairperson Marie Hilao-Enriquez said that the incident follows the announcement of the new three-year counter-insurgency plan by the newly installed Armed Forces of the Philippines (AFP) Chief of Staff Lt. Gen. Ricardo David. “Neither Gen. David nor President Noynoy have called to stop the killings and to end the culture of impunity that still prevails,” Enriquez said. “The lack of declaration from President Noynoy to stop the killings and impunity, coupled by Gen. David’s pronouncement of another deadline to end insurgency, and this new wave of political killings, signals that former president Gloria Arroyo’s counter-insurgency program, Oplan Bantay Laya, is still enforced under Mr. Aquino’s term and has not let up on targeting progressive individuals”, Enriquez said. She also noted that in June, seven individuals were killed, including an Ampatuan massacre witness, and last week, a former lawyer of the Mangudadatus was ambushed. 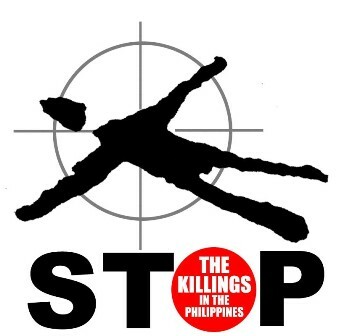 Next Post HUMAN RIGHTS WATCH TOLD AQUINO TO STOP THE KILLINGS!